The game controls and plays a little like classic arcade and NES games like Asteroids, Gravitar, and Solar Jetman. You steer with the left analog stick and thrust forward with the R2 button. 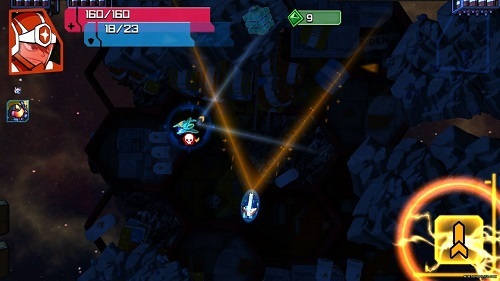 If you are piloting the mech, press a button for a short ranged attack. The spaceship has longer ranged projectiles that you can hold down the button to rapid fire. When a meter goes up, you can use a special attack. Both the mech and ship have different shields. When you get hit, the shield goes down, but comes back over time. But if it is temporarily destroyed and you get hit, you’ll lose energy. Lose all energy and you must start the mission over again. Usually missions require you to navigate a cave maze, defeating enemies and collecting items while finding the exit. After you complete a mission, you can upgrade your ship with items you’ve collected in the menu screen. This is where the free-to-play nature of the game rears its ugly head. There are tons of items to use to upgrade things, like crystals, robot parts, and even robots you can send to a lab to make more parts over time. But this process ends up being more fiddly than fun. Plus, the game wants you to buy these things so you don’t have to take forever to collect them, so the game gets hard pretty fast. Plus, you have to always be connected online to play, even though most of it is single player. I know that’s the norm for mobile games now, but this is on the Switch. Even free-to-play games like Pokemon Quest didn’t make you do that. Because of that and the fiddly nature of upgrading, this game didn’t hold my interest very long, even though I did like the arcade space themes. 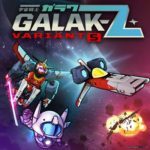 Galak-Z is rated E-10 with ESRB descriptors of Fantasy Violence and Mild Language. You do blow up spaceships and robots that explode when defeated. I didn’t notice any bad language in the text, so it must be used very sparingly. Reading skill is needed for the text and parental supervision is recommended for the in-game purchases. I’m glad I read the review. I’ve had the PS4 version in my backlog for a while now, but I love playing stuff on Switch when it’s available there. I put this one on my wish list before it came out, and I swear when I did so it had a (not-free) sticker price. I had no idea they’d gone free-to-play, so I guess there’s no reason not to install it and see how it works. I wonder how the economy works compared to the buy-to-play version?